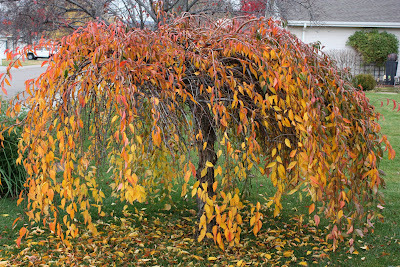 A weeping dwarf cherry tree. This tree in my front yard has come close to getting cut down because of frustration over controlling bugs. It's infested every year. But then it charms me with this autumn show, and the spring flowering show, and I decide it can stay for a while longer. This tree is probably close to 10 years old. It doesn't get taller. It does grow wider if I don't keep it trimmed.